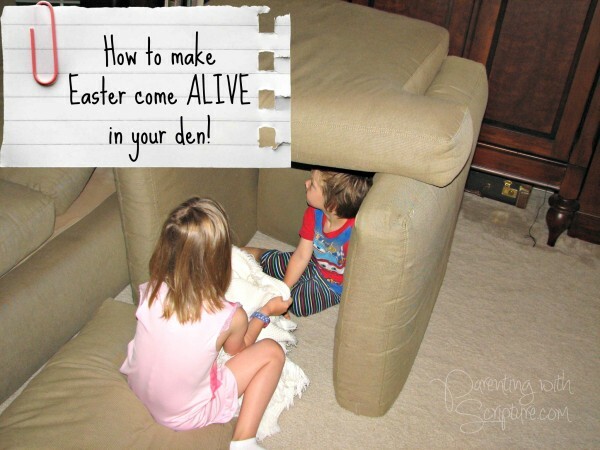 How to make the Easter story come ALIVE in your living room! I am convinced that creating traditions for our families is one of the most important parts of parenting. 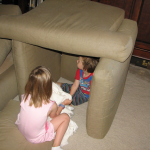 A church friend of mine started the tradition of acting out the Easter story in their den when their oldest, now 11, was still quite little. 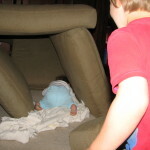 Several years, 3 kids, and lots of treasured memories later, they are still at it. “We read aloud to our children quite a bit when they were young. They enjoyed the Read Aloud Bible Stories by Ella Lindvall. They would hear “A Sad Day and a Happy Day” from Volume 2 often. They knew the sequence of Jesus dying for our sins and age appropriate details of his death. We talked with them about the quiet weekend and then celebrating Jesus rising from the dead on Resurrection Day. 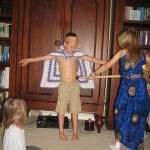 Also, we have always had a big box full of stuff that serves as props for pretend play. It holds things like costumes, big pieces of fabric, sashes and hats. 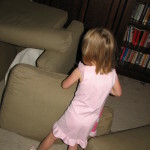 Here’s a peek into the VanEerden living room from a couple of the years! – Happy JESUS IS ALIVE!!! I’m willing to bet that these kids will carry on this tradition with their own children some day. Don’t you think so? What’s your favorite family Easter tradition? Not sure about the true meaning of Easter? Or, do you struggle in knowing how to explain the purpose of Easter to your children? See the topic of “Salvation” in your copy of Parenting with Scripture: A Topical Guide for Teachable Moments. 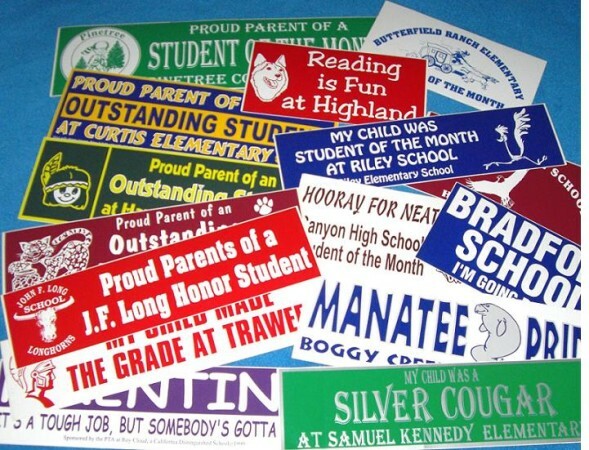 Read this & you’ll be ready next time you see an “honor roll” bumper sticker! You know those “My child is on the honor roll” bumper stickers? Next time we see one of those stickers on the back of a car, let’s make use of that teachable moment with our kids! Would I rather you be a honor student or honorable? 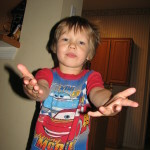 What does it mean to be honorable, what does God say about it, and what are some creative ways to help my child understand? Refer to the related topics of Character and Integrity in your copy of Parenting with Scripture: A Topical Guide for Teachable Moments. Please help our children to have clear consciences before you and desire to live honorably in every way. Please give us YOUR wisdom as we teach and parent them to this end. Let us, as parents, have the same desire for our own lives. Thank You for Your grace when we are less than honorable. Help us love our children the way You love us. Caring for pets & a conversation to have with your kids before it’s too late! 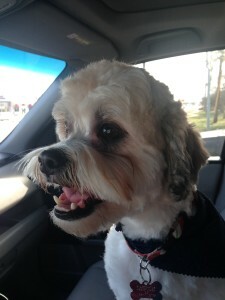 Last April Fool’s Day I had a few of you thinking I had lost my mind with my “Pet Parenting with Scripture” blog title. However, the concept did actually bring up some interesting points and I wanted to include a couple of additional ones here. or they didn’t want to take the time to feed our pet. It’s been a good discussion. Conversation to have with your kids about animals before it’s too late! Yes, we need take good care of any animal we bring to our home as a pet. 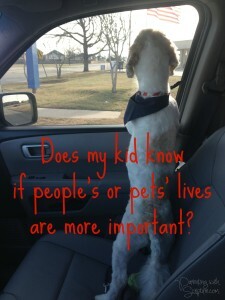 However, we also need to help kids understand the value of their lives versus the pet’s. Anyone else have a door dasher dog? One day, foster Gumbo bolted out the door and the kids and I dashed after him as fast as we could. I was terrified that Gumbo was going to dart in front of a car. But, I was even more terrified that my kids would run into the street after him without thinking since they were in such hot pursuit after this little doggy that we had been entrusted to care for and had come to adore. Thankfully we caught him, but it reminded me that I needed to have a serious chat with my kids about the value of their lives versus our pets’. *As much as we love our pets/animals, people are always more important. *If it’s a choice between the pet or you getting hurt, make the decision to keep yourself safe. Then I threw out several “What if?” scenarios to see if they really understood. I want them to have already thought through these things so they will be equipped when split second decisions are necessary! I’m still haunted by this tragic news story where three family members drown trying to save their dog. After watching my kids running after Gumbo to try to catch and protect him, I can more easily see how something like that could happen. Hence, my conversation with my kids and my encouragement to you, my lovely readers, to do the same. 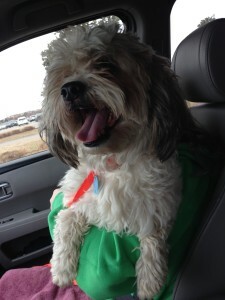 This was the day we picked up Gumbo from the rescue. He was a scruffy mess, but stole my heart right away! Lookin’ good after his first grooming! He could finally see the world! Parenting with Scripture: A Topical Guide for Teachable Moments. 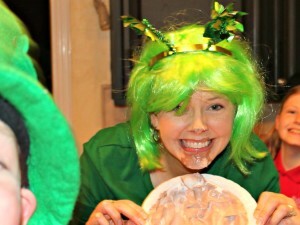 St. Patrick’s Day Silliness & Scripture! 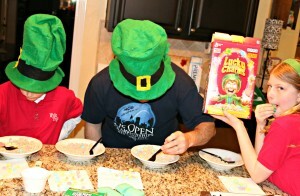 St. Patrick’s Day can be an occasion for some silly family fun as well as a teachable moment with Scripture! Did you know that St. Patrick used the Shamrock to teach about the Trinity? 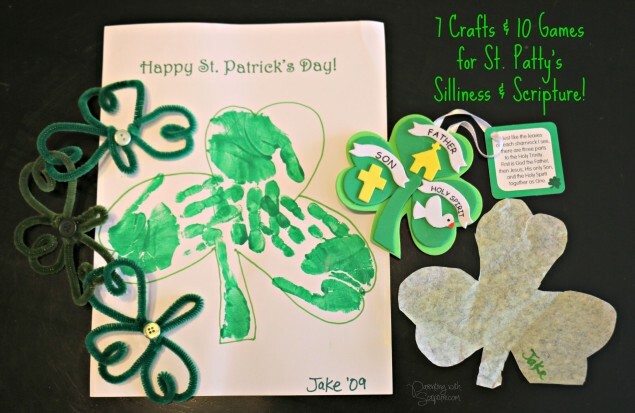 CLICK HERE to read more about that and see 7 simple shamrock crafts with instructions. Create fun memories with your family by playing St. Patrick’s Day minute-to-win-it games! Surprise your family with the supplies to play these games on or around St. Patrick’s Day. Have your camera ready, because they are sure to make for some great Kodak moments! 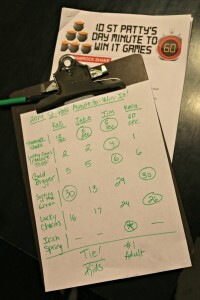 CLICK HERE for the link we used for the 10 Minute-to-Win-it Games. No need to score, but our family enjoys friendly competition! I can assure you that my kids will never forget when I picked them up from a playdate wearing this neon green wig! All our hats, wig, and headbands were found at Target dollar section or dollar store. 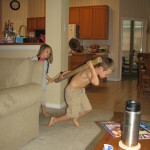 This is a picture of the “Gold Digger” game. 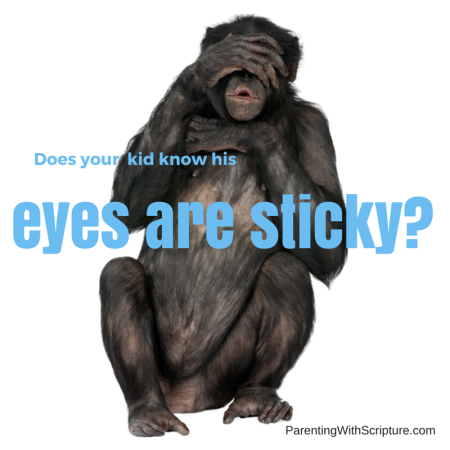 Does your kid know his eyes are sticky? 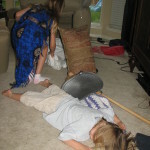 This was the lament of one of my carpool kids one morning on the way to school. He was referring to a photo of his sister’s removed tonsils. Ha, I can only imagine! What a great teachable moment! We talked about how what we look at can stick with us and continue to impact us. He still grimaced as he talked about the picture he had seen a couple of years prior. It was also a great chance to remind them that if anything they know is wrong pops up on a computer to look away quickly and let an adult know immediately! I couldn’t think of a related Bible verse right away, so I asked if they could. * Another one thought of the funny monkeys and their “hear no evil, see no evil, speak no evil” hands. I loved how those comments contributed to the overall discussion. It’s always amazing to hear how kids interpret and connect things. On the way home from school, I followed up with this verse and talked about how our eyes are sticky. Meaning, we can’t “unsee” things. The images stick with us and impact our lives. Do your kids know that their eyes are sticky?